The New Horizons mission has earned about two-dozen team and individual awards since pulling off a historic flyby of Pluto in July 2015. But its latest honor – the NASA Group Achievement Award – holds a special place on the list. Nearly 200 team members from institutions across the country gathered after a science team meeting at the Johns Hopkins University Applied Physics Laboratory in Laurel, Maryland, on Jan. 19 – the 11th anniversary of New Horizons' launch – to receive their award certificates, while others participated online from remote locations. All told, NASA honored more than 600 people for their work on the development and flight of New Horizons. "This [award] is pretty special," said Ralph Semmel, director of APL, which manages the mission for NASA and built and operates the New Horizons Spacecraft. "Unlike the awards that recognize specific aspects of the mission, this one was earned by and is being presented to the entire New Horizons team, and recognizes what amounts to amazing collaboration and teamwork that was necessary to make the entire mission a success. And here at APL, we place a premium on teamwork, so I'm particularly pleased to be able to celebrate this award with you." In addition to the opening remarks from Semmel and closing comments from APL Space Exploration Sector Head Mike Ryschkewitsch, former mission Project Manager Glen Fountain introduced each team member present, while mission Principal Investigator Alan Stern, from the Southwest Research Institute (SwRI), and NASA Planetary Science Division Director Jim Green both spoke before presenting the awards. "The best part of this award is its first word – group," Stern said. "The success of New Horizons has been a group effort by a wonderful and talented team of dedicated professionals." "This team has worked flawlessly for long periods of time, and very few people understand what it takes to do that," Green said. "That takes dedication, that takes concentration, [and] that takes everything each and every one of you have to have to burn a hole in steel. That's what puts you above everything else. So it's just delightful to be here, to represent NASA, recognizing this extraordinary team, that's made historic accomplishments in the fabulous flyby of the Pluto system." After a 9.5 year, 3.5 billion mile journey, New Horizons flew through the Pluto system in July 2015, providing the first close-up images of Pluto and its moons and opening the door to an unexplored realm of the solar system. The spacecraft – built and operated at APL with a payload and science investigation led by SwRI – is more than 400 million miles beyond Pluto, speeding toward an encounter with Kuiper Belt object 2014 MU69 on Jan. 1, 2019. 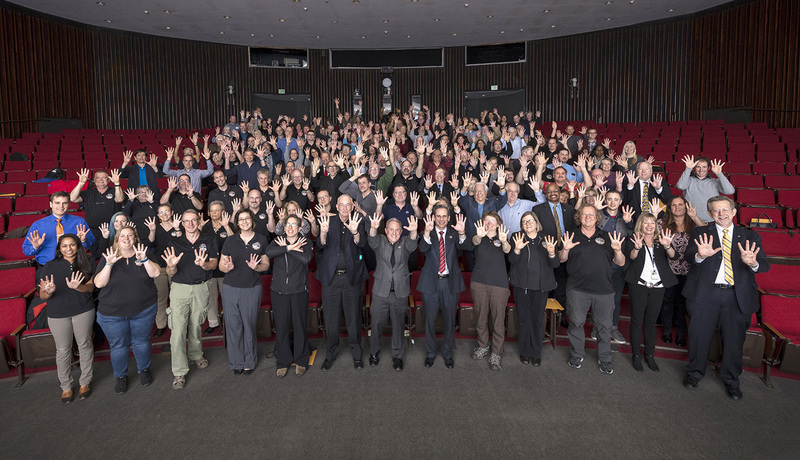 New Horizons team members give the "Pluto salute" after the NASA Group Achievement Award presentation at the Johns Hopkins Applied Physics Laboratory on Jan. 19 – the 11th anniversary of the launch that sent New Horizons toward Pluto and Kuiper Belt. Several NASA and New Horizons team members were also honored with an International Academy of Astronautics Laurels Award. 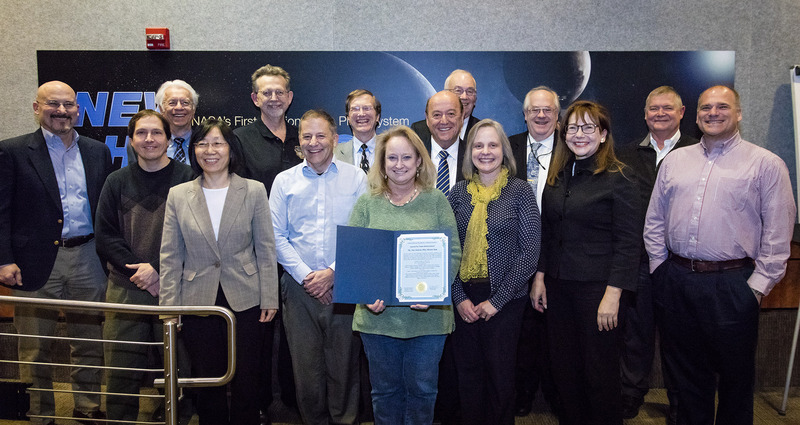 The 2016 Laurels for Team Achievement, awarded in September and presented to team members in January ceremonies at APL, recognized the extraordinary performance and achievement by the scientists, engineers, technicians, and managers whose talent, skills and dedication made possible the completion of the reconnaissance of the solar system with the first mission to Pluto. Jean-Michel Contant, IAA secretary general, presented the awards. Honored team members included Alan Stern, Hal Weaver, Glen Fountain, Peter Bedini, Alice Bowman, Andrew Calloway, Yanping Guo, Chris Hersman, Mark Holdridge, Valerie Mallder, Gabe Rogers, Bobby Williams, Jim Green, James Lee, Curt Niebur, Adriana Ocampo, John Spencer, Kim Ennico-Smith, Cathy Olkin, Leslie Young, Jeff Moore, Randy Gladstone, Will Grundy, Fran Bagenal, William McKinnon, Andrew Cheng, Mihály Horányi, David McComas and Ralph McNutt. Tom Coughlin, the mission's first project manager, was honored posthumously. After the IAA Laurels presentation at the Johns Hopkins Applied Physics Laboratory on Jan. 4, IAA Secretary General Jean-Michel Contant (center) gathers with NASA, APL and New Horizons team members (from left) Chris Hersman, Andy Calloway, Tom Krimigis, Yanping Guo, Jim Green, Mark Holdridge, Hal Weaver, Val Mallder, Glen Fountain, Alice Bowman, Ralph McNutt, Adriana Ocampo, Mike Ryschkewitsch and Curt Niebur. 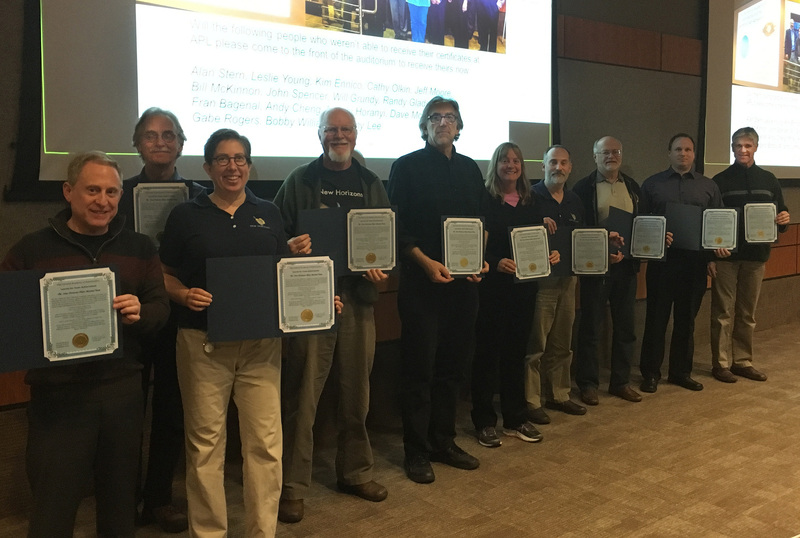 Several team members who were unable to attend the Jan. 4 ceremony received their awards during the New Horizons science team meeting at APL on Jan. 18. Pictured (from left) are Alan Stern, John Spencer, Leslie Young, Jeffrey Moore, William McKinnon, Cathy Olkin, Will Grundy, Randy Gladstone, Gabe Rogers and James Lee.